Not to be confused with Damascus, Syria. 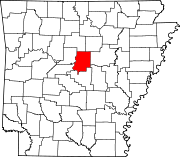 Location of Damascus in Faulkner County and Van Buren County, Arkansas. Damascus is a city in Faulkner and Van Buren counties of central Arkansas, United States. The population of Damascus was 382 at the 2010 census. Damascus was the site of a nuclear "Broken Arrow" incident on September 18–19, 1980 when a Titan missile exploded, although no radiation was spread as a result of the explosion. Damascus is located at 35°22′2″N 92°24′35″W﻿ / ﻿35.36722°N 92.40972°W﻿ / 35.36722; -92.40972 (35.3673020, -92.4096005). According to the United States Census Bureau, the town has a total area of 5.0 km² (1.9 mi²), all land. Damascus's portion within Faulkner County is in the northernmost part of the Little Rock–North Little Rock–Conway Metropolitan Statistical Area. As of the census of 2000, there were 306 people, 137 households, and 90 families residing in the town. The population density was 61.2/km² (158.3/mi²). There were 157 housing units at an average density of 31.4/km² (81.2/mi²). The racial makeup of the town was 97.71% White, 0.98% Black or African American, 0.33% Native American, and 0.98% from two or more races. 1.31% of the population were Hispanic or Latino of any race. There were 137 households out of which 26.3% had children under the age of 18 living with them, 53.3% were married couples living together, 7.3% had a female householder with no husband present, and 34.3% were non-families. 30.7% of all households were made up of individuals and 19.0% had someone living alone who was 65 years of age or older. The average household size was 2.23 and the average family size was 2.81. In the town the population was spread out with 21.2% under the age of 18, 5.9% from 18 to 24, 25.2% from 25 to 44, 21.9% from 45 to 64, and 25.8% who were 65 years of age or older. The median age was 44 years. For every 100 females, there were 96.2 males. For every 100 females age 18 and over, there were 88.3 males. The median income for a household in the town was $28,977, and the median income for a family was $38,750. Males had a median income of $28,214 versus $16,458 for females. The per capita income for the town was $18,342. About 1.3% of families and 8.0% of the population were below the poverty line, including none of those under the age of eighteen and 22.2% of those sixty five or over. In February 2017, Damascus was deemed a "speed trap" by a state judge per state statute, which presumes a city has abused its police power by ticketing drivers on a highway to produce revenues that exceed 30% of the city expenditures. Analyzing a year's worth of speeding tickets from June 2015 to 2016 showed more than 75% of those drivers were within 4 miles per hour of the 60 MPH speed limit. Public education for elementary and secondary school students is available from the South Side School District. ^ a b c d e f Geographic Names Information System (GNIS) details for Damascus, Arkansas; United States Geological Survey (USGS); April 30, 1980. ^ "Annual Estimates of the Resident Population for Incorporated Places: April 1, 2010 to July 1, 2015". Retrieved June 2, 2016. ^ Damascus - It's a Speed Trap. Now What?